REVIEW: Theresa Romain’s TO CHARM A NAUGHTY COUNTESS, Or Just To Love Her? Miss Bates assumed that Romain’s To Charm A Naughty Countess would provide a few hours of fun with some histrom fluff, one of the ephemeral romance novels that one reads and promptly forgets. She was surprised to find a unique, well-written, angst-filled novel with flawed but likeable protagonists, tackling challenging issues for the hero, in particular. Recently, historical romance has the maddening habit of using long, cumbersome titles that are likely to misrepresent the content. This is true of Romain’s novel, as it is of others. Miss Bates reckons that the “fluffy” titles are a buying inducement; if so, it has the opposite effect on Miss Bates, as does the smirking heroine cover, which also graces Romain’s novel. Miss Bates, however, does not dictate the terms of the genre … though she’d like to. 😉 In Romain’s novel’s case, the title serves to tell the reader what this novel is not about. The hero, Michael Layward, Duke of Wyverne, is the least charming duke Miss Bates has ever encountered in the pages of a romance novel. Charm is one weapon he is incapable of wielding in winning his countess, Caroline Graves; honesty, intelligence, and humour serve him well and are preferred qualities, to Miss Bates at least. His countess is beautiful, smart, kind, and compassionate; she isn’t naughty, a word Miss Bates despises, conjuring only nasty images of ludicrous Benny Hill episodes. To Charm A Naughty Countess surprised Miss Bates and she very much enjoyed it. It is not flawless, but it is one of the better historical romances a reader could spend time with this year. The novel opens at Michael’s Lancashire estate, Callows, in 1816. He is desperate for money; he made improvements to the agricultural yield on his tenants’ farms, but the never-ending winter foiled his plans. Spring did not arrive. It looks like Michael is headed to financial ruin, which devastates him more for his tenants’ sake than himself. With a strong sense of the care-taker’s responsibility and at the urging of his steward, Michael understands that he must marry wealth to save the estate and tenants’ livelihood. Though he suffers from debilitating social anxiety and hasn’t been to London as part of the ton in eleven years, Michael ventures forth to disastrous results … until he re-encounters the Caroline of his youthful folly. He meets the beautiful, now widowed woman, eleven years later; at the time, he’d left London, with his father’s death, to take over the responsibility of running the family holdings. Bitter history lies between them, at least on Caroline’s part. Michael, on the other hand, possesses the cluelessness of the introverted and studious. Michael is attracted to Caroline, but he doesn’t know how to name it. He’s hot and bothered in her presence, but doesn’t recognize desire. All he knows is that she makes him experience loss of control. A man beset by a nervous stomach and terrible headaches, he doesn’t understand how to navigate society, or his body’s demands. Michael is a 31-year-old virgin. Caroline is equally affected by Michael. She has come a long way since he abandoned her after their initial amour: a parson’s daughter, genteel, not aristocratic, she married well and inherited her elderly husband’s money. She has suitors galore, especially one persistently unsavory nephew (who serves as the villain of the piece). Her physical and emotional response to Michael is as immediate as his to her. Though she has reason to resent him, she still loves him and embarks on a campaign to help him woo a wife to keep his land, all in the name of furthering her impeccable reputation as a ton favorite. Old feelings and desires surface and Michael and Caroline cannot keep away from each other. The novel picks up when Caroline organizes a house party at Michael’s Lancashire estate, again as part of her wife-finding endeavours. On his part, all he wants is Caroline. She solves his solvency and stands for the only woman he desires. She soothes his social anxiety and guides him to negotiating his way through a bewildering world. Caroline, however, needs to be needed and loved. Michael loves, but is insensible to his heart and socially inept; he doesn’t know how to tell her so. Miss Bates found much to like about Romain’s To Charm A Naughty Countess. The prose was polished and spoke for a writer in control of her craft. Mainly, Miss Bates liked Caroline and Michael. Caroline, in particular, is a sympathetic heroine-portrayal. When Michael leaves her, if not in social disgrace, but with a hint of scandal clinging, she makes the best of her situation. She may cry in private, but puts on a brave face in public. There’s something to be said for that. When they are re-united, she doesn’t turn into angsty, revenge-seeking Godzilla woman, but treats Michael with kindness and compassion. There’s much to be said for that too. However, in the interim, she didn’t sit around filling in her sampler and pining for Michael. She enjoys her money and status. She takes lovers … albeit this is a romance and she divests herself of one Andrew, Baron Hart, at the first sight of Michael. Miss Bates liked reading a sexually confident heroine; she wishes, however, that Caroline shared a friendship with her lover, a camaraderie, if not love. Instead, Andrew disappears after his first intriguing appearance and Caroline is overwhelmed by feelings of no-other-man-will-do when she sees Michael again. Her motivation in helping Michael’s matrimonial pursuits is muddy to Miss Bates, especially after she and Michael become lovers. Equally unconvincing and vague are her reasons for the house party. This was a blimp for Romain. It feels as if she over-rode it instead of tackling a problematic plot point. Michael/Caroline are classic opposites-attract trope. They are compelling leads and exchange great dialogue as they debate the difficulty of finding balance between duty and pleasure, need and love, necessity and happiness, public persona and intimacy. Romain also paints some lovely scenes. Michael’s poise grows and he steers the house party quite well. When they arrive, he serves a novel fiddlehead soup (yay, for fiddleheads, your season is too short for Miss B.) and entertains them with a magic lantern show. He may still suffer from his condition, but Caroline taught him to play to his strengths. Caroline now feels diminished and less needed and her role loses some of its vibrancy. Hero rises; heroine wanes. In that sense, Miss B. liked the narrative less, but was glad to see the confidence in Michael nevertheless. Miss Bates enjoyed Romain’s homage to Pride and Prejudice in Caroline’s shift in how she sees Michael when she arrives at Callows. It echoes Elizabeth’s entrance to Pemberley. There is a wild and windy scene when Caroline comes upon Michael, in his shirtsleeves, surveying his land. It’s good. Michael and Caroline, while opposites, look to complement each other well in the future, which is what makes the trope beloved. “Opposites” provide tension; the future complementarity, hope. Miss Bates wishes there were more scenes such as the ones she mentioned above. The handful of scenes she describes make up what are outside scenes. For the most part, the narrative takes place in the leads’ heads: Michael in agony over his social anxiety, worried for his land and tenants, confused over his feelings for Caroline. All in his head all the time. In turn, Miss Bates says the same of Caroline: Caroline plotting on Michael’s behalf, rationalizing her reasons for doing so, lusting after Michael’s body, feeling lonely and bereft when he’s not around. In her head all the time. The few scenes that bring us out into the world of 1816 England are refreshing and pleasurable. Not enough of them and this lessened Miss Bates’ reading pleasure. Yet, there is much to like about Romain’s To Charm A Naughty Countess; therein Miss Bates found evidence of “a mind lively and at ease,” Emma. 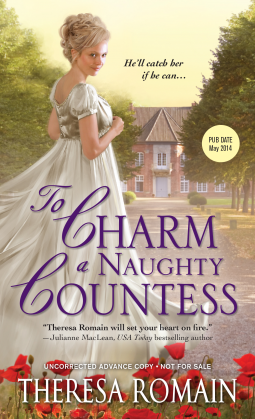 Theresa Romain’s To Charm A Naughty Countess is published by Sourcebooks Casablanca. It has been available since May 6th in e-format and paper at the usual vendors. Miss Bates received a courtesy ARC, from the publisher, via Netgalley, with the expectation of a review. « The “Beginning of a Beautiful Friendship”: Mary Stewart’s MADAM, WILL YOU TALK? This sounds like a lovely romance! I love the gentle stories that build the characters towards each other despite past wrongs rather than angsty revenge that always feel like overkill. It is quite a good read: not what Miss B. expected, with more gravitas and sensibility than the silly title and smirk-y cover give it credit. No revenge, no nastiness: Miss B. liked the clueless hero and smart, loving heroine. It surprised her. Toooooo much time in the headspaces, though. I think that is the age old gripe of romance readers – covers and titles that diminish the worth of both the author and reader. Marketers who don’t read the books and pick fun at the reader. This will always annoy me. Miss B. just started what may prove to be a lovely romance, took one look at the cover, and as you say, grew utterly annoyed. The heroine has RED hair and the hero blonde, down to his shoulders: the cover gives her short, dark hair and his looks like he’s near buzz-cut and light brown. Why!? Aggh! Because the cover people, the marketers, the decision makers override the central creator’s work and apply a cover formula (unlike a writing formula, this does actually exist) that predicts sales due to colours and looks. As long as the production team around the actual romance treat it with disdain, how can we expect anyone outside of the the readership to treat it otherwise (I may be on a soap box today). This sounds terrific! Thanks for the rec. Miss B. thinks you’ll enjoy it. 🙂 The writing is polished too. And, of course, you’re most welcome!